Nine months pregnant and carrying her 2-year-old in her arms, Mary ran from her home in Unity State, South Sudan, where widespread violence has killed and injured thousands of people since December. Mary holds the hand of her toddler as she walks toward the makeshift camp they now call home. Driving up a long, dusty dirt road, haphazardly created structures line the road as far as the eye can see. This is Mary’s temporary “home,” a camp for families displaced by the violence in South Sudan. Tents made of the only available materials – sticks, women’s clothing, old plastic bags, sheets, and pieces of canvas are scattered everywhere. Some people sleep under branches, without any covering at all. Mary fled violence in her home town in South Sudan. Three days after arriving in a camp, she gave birth to her son Amel. Mary arrived at the camp just three days before giving birth to her second son. She named him Amel. She delivered Amel outdoors, with no help. “At the time I delivered I was alone. I was feeling bad. My body was in pain and it was not well,” she said. Fortunately, someone felt compassion for her and allowed her to take shelter in a school building nearby. Like thousands of others who fled for their lives, Mary doesn’t have food or even a pot to cook food, if she had any. She was given some beans and flour, but sold some for oil and salt to cook with. “We fear now that if we eat twice a day the food will be gone and we don’t know when we’ll get more,” she said. Tiny Amel was born homeless. Now, he’s sick. His family has no place to go after fleeing their home. And they’re sick. Amel has diarrhea – very dangerous for a newborn. Mary has stomach pains whenever she eats, too. The rains have arrived early in South Sudan … not good news for families like Mary’s who are living in makeshift tents. Flooding and poor sanitation make diarrhea and sickness an even greater threat. World Concern is responding in this area, providing shelter materials, emergency supplies, and food to displaced families. We’re also providing long-term support, so families like Mary’s can resettle, earn income, and begin to rebuild their lives. Click here to help. Mary and other moms whose “hearts are beating in fear” tonight. Donate to help families in South Sudan survive this crisis. 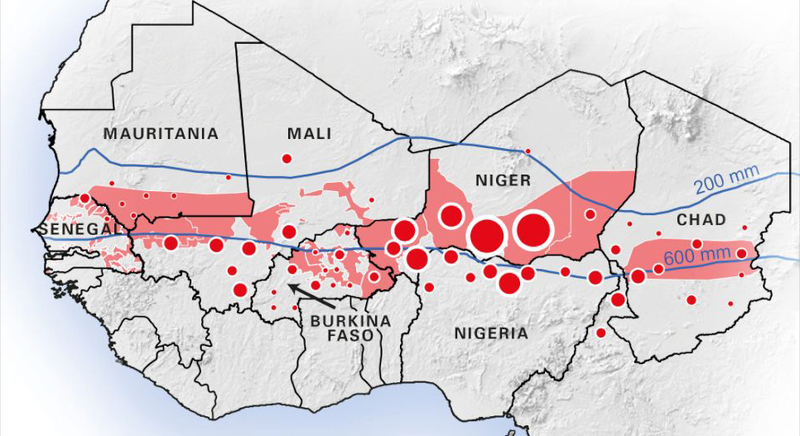 A UN map shows areas of the Sahel affected by drought in pink. Red circles indicate expected cases of severe malnutrition in 2012. There’s a crisis brewing in the Sahel – a swath of dry land that cuts through Central Africa. The people who live in the Sahel are familiar with crisis. They face ongoing challenges – armed conflicts, drought, poverty and lack of resources. It rarely rains in parts of the Sahel. Nevertheless, entire populations are dependent on rain-fed crops for survival. The rains this past season were less than average and sporadic. Crops failed, food prices soared, and now, the UN is alerting the world to a looming food crisis. In Chad, where World Concern works with families displaced by the Darfur war and conflicts within Chad, a million and a half people are at risk of hunger. The UN estimates that 127,000 children under the age of 5 will be affected by severe acute malnutrition this year in Chad’s Sahel region. 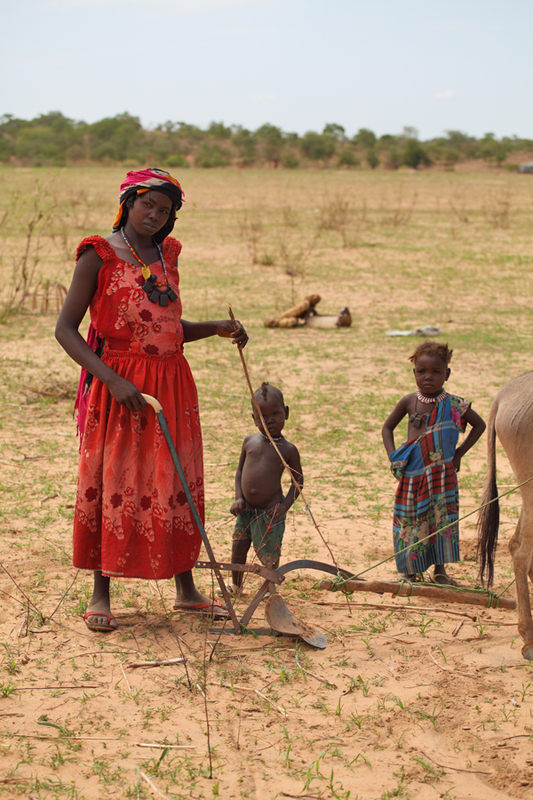 A mother in Chad gets ready to plow her field with her donkey plow she received from World Concern. The lean season—the period between harvests when families depend on stored food from the previous harvest—is expected to be the most severe in years. World Concern’s programs in Chad provide families with farming tools, training and seeds to grow drought-resistant crops. Now is the time to respond to this growing crisis and help families survive the lean season, and prepare for the next harvest. You can help save lives and prevent this crisis from worsening. Click here to donate.